Traveling for business can be an exhausting experience. There are so many factors involved that can turn a good trip into a bad trip at any moment. 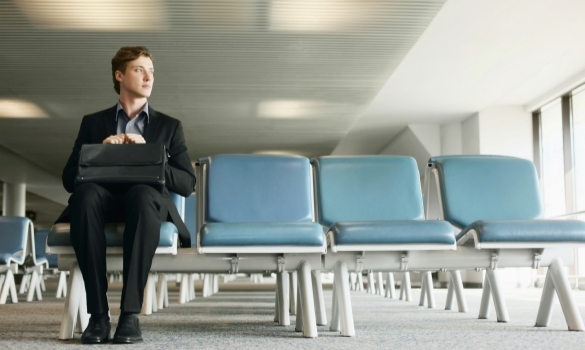 Be prepared for the worst by following these top four tips for the business traveller. A checklist is an excellent way to ensure you do not forget important items when packing. Start with the absolute must-haves: your wallet, passport, ticket, keys, laptop and any medication you need. Make sure you have some cash in your wallet as well as your cards, and be sure to familiarize yourself with the Euro rate if traveling internationally. Most useful items beyond these essentials can be purchased when you arrive. Use your checklist to make sure you have enough clothes for each day of your trip. It is also wise to pack an extra of each clothing item, in case it rains or you spill coffee on yourself. If you are presenting at your destination, make sure your digital documents and files, laptop, chargers and handouts are on the checklist. Do not leave packing to memory alone. Even the most seasoned business travellers use a checklist, you would be wise to do so as well. If you are flying to your destination, avoid checking any luggage. There are three advantages to doing so for executive travel. First, using only carry-on luggage will save you time at the other end. You will not need to wait for bags and can stroll right through to customs or security. Second, it will force you to pack lightly and only bring what you need. Pack one pair of shoes, and remember you will be wearing another. You cannot bring your whole closet. Finally, given that most airlines now charge for checked luggage, sticking to a carry-on will save you some money. If you want to be a successful business traveller, try to avoid checking bags. There are many rewards programs available to the business traveller. Some of them are through credit card companies. They often involve cash back offers or air miles as thank you sayings for your loyalty. You can use these perks for a personal vacation or to treat yourself when you arrive at your destination. Some airports offer expedited check-in when you join their club. Consider the time you may save by using these programs. Time saved waiting in line can be put to more productive use, such as reviewing your laptop presentation or calling the office to check in. When you do decide on a rewards program, stick with it. The best perks often come with long-term membership and the accrual of a high number of points. When you begin your life as a business traveller, be sure to use a rewards program that fits your professional lifestyle. Make sure you take care of yourself when you travel. Get a good night’s sleep before you leave, and use travel time to relax when possible. If you absolutely must work on your flight, take breaks so you do not arrive stressed. Be sure to stretch periodically and practice deep breathing techniques to stay relaxed. Exercise when you get to your destination and take advantage of healthy meal options from a local food business when you can. There may be times when you have no choice but to grab fast food at the last minute, so make your other meals count. Drink lots of water in between the frequent Starbucks franchise visits. Wash your hands periodically and avoid airline pillows that are not wrapped in plastic. Do your best to stay healthy as a business traveller; your body will thank you for it. If you are a frequent business traveler, the best way to travel comfortably and have a successful business trip every time is to learn from other corporate travelers. Thankfully, there is a website just for travel discounts. Business Traveller provides a whole slew of business travel resources for people just like you. You can visit the site to learn about everything from new Kuala Lumpur hotels to the best bars and restaurants in any city or country. You can also learn about the best places to rent company cars. This site can definitely help you to be prepared for any domestic or international business trip. Many business travellers overlook the importance of non-stop flights. The delays causes in connecting or “direct” flights waste precious time and productivity during the week. You might overlook the difference between non-stop and direct flights. Direct flights still might stop while you wait on the plane. This significantly adds to your travel time as the aircraft has to descend, land and ascend again. Moreover, it increases your risks of getting stuck in a location other than your destination. When booking for business travel, take non-stop flights whenever possible. Being a business traveller is not always as fun as it sounds. Even with a priority pass, time spent traveling can be tiring and stressful. Stay healthy and active, and relax as much as possible. Avoid checking luggage to keep costs and wait time to a minimum. Find a rewards program that fits your lifestyle and stick with it. Finally, use a checklist so you do not forget essential items. Use this post as a guide to the important things to remember as a business traveller.